We've been working on a new version of the French 75--this one for North Africa. The Marine and Pacific Infantry Battalion (BIMP) was formed from the merger of two battalions decimated during the battle of Bir-Hakeim, Libya, in June 1942: the 1st Marine Infantry Battalion (1st BIM) and Pacific Battalion (BP 1). There were quite a few Algerian Berber flags that were recorded or captured by the French during the conquest of Algeria. 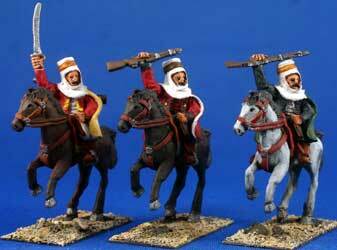 Askari Miniatures is excited to release four sets of mounted Moroccan Berbers. The Algerian rebel Abd el Kader rides again! 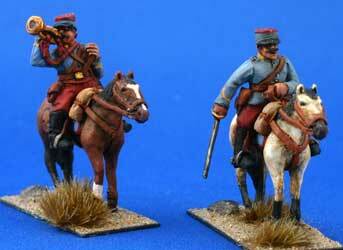 Askari Miniatures has expanded our selection of Chasseurs d'Afrique with three new sets. The Chasseurs d'Afrique, along with the Spahis, were the mounted arm of the French Army of Africa.